What happens when spirited rivals are finally pitted to race against each other? What happens when there’s sanctioned speed with the cameras rolling? A damn good time, that’s what. On April 5th, 2010, SPEED TV will show the full episode of the Forum Wars TV spot featuring StangNet.com against My350Z.com. 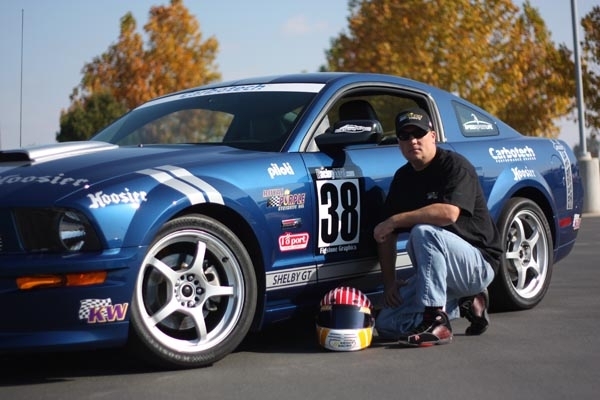 Rob Krider takes the wheel of a 2008 Ford Mustang Shelby GT outfitted with Hoosier Tires, Carbotech Brake pads, and I/O Port Racing Supplies harnesses. Rob’s been a Ford Mustang lover for some time, with his collection ranging from a 1992 Mustang 5.0 LX notch police interceptor to a 2001 Mustang Bullitt in which he autocrossed & drifted at various SCCA events. Over the years, he’s always counted on the StangNet site and community for a lot of his setup & technical advice on all of his Ford Mustangs. I think we should’ve used a more normal car, not a Shelby. Sorry Rob. Wow! You had to put a V8 Shelby GT against a little V6??? WTF! good job bozo… Boo! !